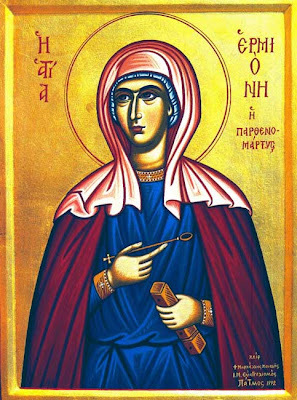 "The Holy Martyr Hermione was a daughter of St Philip the Deacon (October 11). 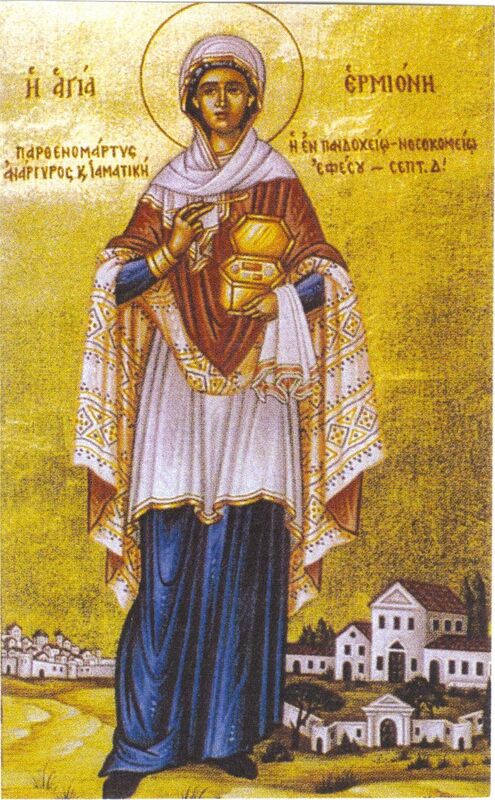 Wishing to see the holy Apostle John the Theologian, Hermione with her sister Eutychia went to Asia Minor in search of the saint. During their journey, they learned the saint had died. 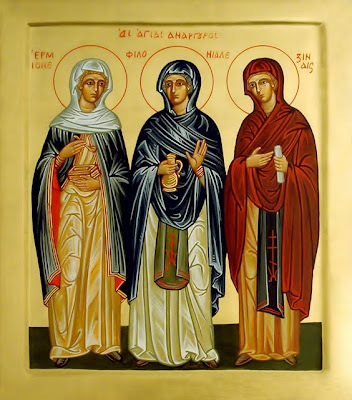 Continuing on, the sisters met a disciple of St Paul named Petronius, and imitating him in everything, they became his disciples. St Hermione, having mastered the healing arts, rendered help to many Christians and healed the sick by the power of Christ. During this period, the emperor Trajan (98-117) waged war against the Persians and he came with his army through the village where the saint lived. When they accused Hermione of being a Christian, he gave orders to bring her to him. At first the emperor, with casual admonitions, sought to persuade the saint to renounce Christ. When this did not succeed, he commanded that she should be struck on the face for several hours, but she joyfully endured this suffering. Moreover, she was comforted by a vision of the Lord, in the form of Petronius, sitting upon the throne of judgment. Convincing himself that she was steadfast in her faith, Trajan sent her away. Hermione later built a hospice in which she took in the sick, treating their infirmities both of body and soul. Trajan's successor, Hadrian, again commanded that the saint be brought to trial for confessing the Christian Faith. At first, the emperor commanded that she be beaten mercilessly, then they pierced the soles of her feet with nails, and finally they threw her into a cauldron with boiling tar, lead and sulphurous brimstone. The saint bore everything, giving thanks to God. And the Lord granted her His mercy: the fire went out, the lead spilled out, and the saint remained unharmed. Hadrian in surprise went up to the place of torture and touched at the cauldron, to ascertain whether it had cooled. When he touched at the cauldron, he burned the skin on his hand, but even this did not dissuade the torturer. He gave orders to heat a sort of skillet and put the holy martyr in it naked. Here again another miracle took place. An angel of the Lord scattered the hot coals and burned many who stood by the fire. 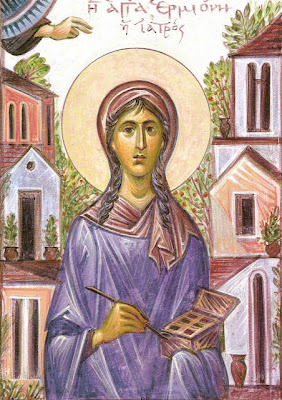 The saint stood in the skillet, as though on green grass, singing hymns of praise to the Lord. When she was removed from the skillet, the holy martyr seemed to be willing to offer sacrifice to the pagan god Hercules. The delighted emperor gave orders to take her off to the temple. When the saint prayed to God, a loud thunderclap was heard, and all the idols in the pagan temple fell and shattered. In a rage, the emperor ordered that Hermione be led out of the city and beheaded. 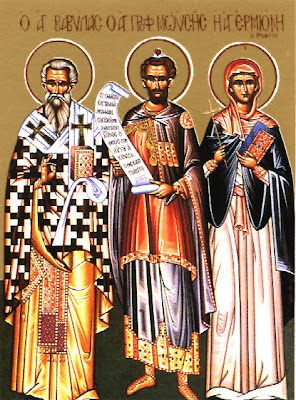 Two servants, Theodulus and Theotimos, were entrusted to carry out the execution. Since they were in such a hurry to execute the saint, not allowing her time for prayer, their hands withered. Then they believed in Jesus Christ and with repentance they fell at the feet of St Hermione. They besought her to pray that the Lord would call them to Himself before her. This is what transpired, through her prayers. After this, she also fell asleep in the Lord." St. Ermione's tomb in Ephesus became a place of healing and pilgrimage. It was here that St. Myrope would visit, distributing the holy myrrh flowing from the grave for the healing of the faithful (and this was in fact the source of St. Myrope's name). For more on Sts. Isidore and Myrope the Great Martyrs, see: http://full-of-grace-and-truth.blogspot.com/2009/05/sts-isidore-and-myrope-great-martyrs.html. O pure one, you were an untouched virgin, and were wedded to Him Who was born of a Pure Virgin, and spoke in the flesh, therefore you were granted divine grace and the struggle of piety to enlighten those in error. Therefore, O Ermione, Christ worthily glorified you. A fruitful vine and unfading flower, O Philip the famed among the sacred Deacons, you showed forth divine grace, O all-wondrous Ermione, and struggled virginally, offering to Christ our God Who glorified you, your pleasing struggles. Let all of us praise in odes Ermione, and cry out in joy: hail the boast of virgins and martyrs, the protection and surrounding wall of the faithful. 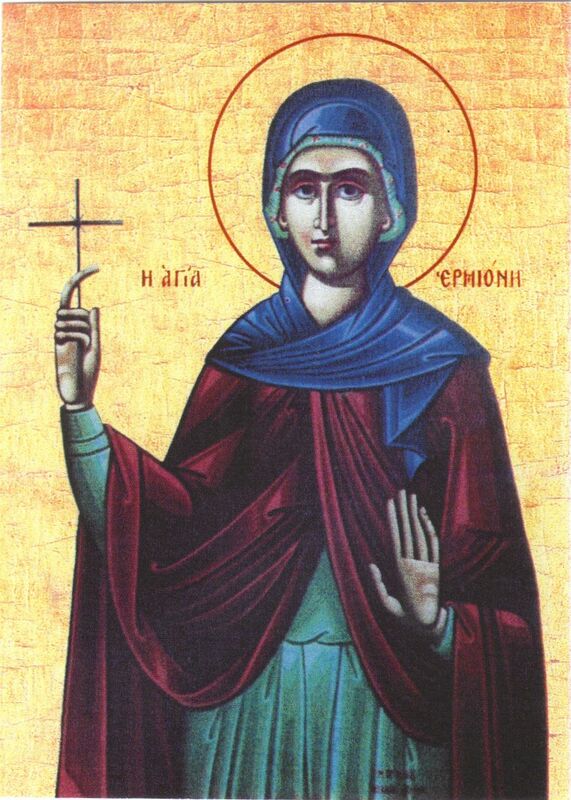 Holy Martyr Hermione, pray for us.